Mix the egg, bread crumbs, milk and onion. Add ground beef and mix well. Shape into 20 meatballs and arrange on shallow baking pan. 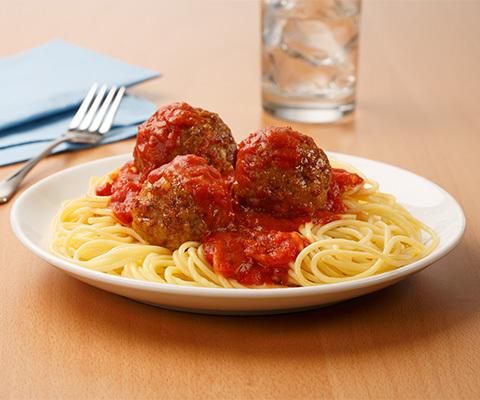 Bake for 20 minutes or until the meatballs reach an internal temperature of 165°F, measured with an instant thermometer. Meanwhile, cook pasta according to package instructions and heat sauce to a simmer on the stovetop. Add the meatballs to the sauce. Combine the drained pasta with the sauce and meatballs.